When I was a kid, few holidays held as much raw excitement as Halloween. On Halloween, I could dress as whatever I wanted, stay out as late as I wanted and eat as many sweets as I wanted. It’s difficult to choose my absolute favorite aspect of Halloween; however, there’s one part of the festivities that proved enjoyable year after year: prospecting my Halloween candy haul. Between my siblings and I, there’d be mountains of candy on the living room floor before Halloween was over. And eating the candy was only half the fun; the real treat was seeing which sibling got the best candy. When it came to hunting Halloween treats, there were those houses you visited several times a night, and there were those you avoided entirely. It’s just like online B2B content today really: There are brands offering content so coveted, you frequent their websites several times a day, and there are those producing content so frighteningly awful, you wish they’d just turn the lights off and lock the door. 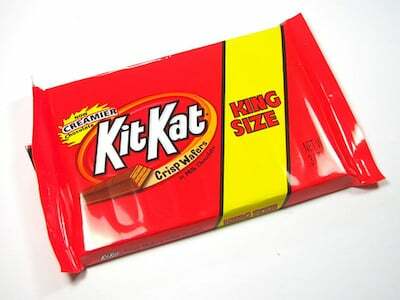 In Trick-or-Treating, the King Size candy bar was the mother load. Sure, the treat was HUGE, but that wasn’t the real appeal. The real appeal was that, compared to the other Halloween goodies, it was above and beyond what Trick-or-Treaters expected. When it comes to producing content, your brand should strive to be the one handing out King Size content. This means you need to go above and beyond your audience’s content expectations. Sure, it’s tempting to merely one-up competitors’ content efforts—just as it’s tempting to hand out only slightly better treats than Dave next door—but that’s not the purpose of content. The purpose of content is to give your audiences information they’ll come back for again and again. Another great thing about King Size candy bars? It never really mattered what the candy actually was. Kit Kat, Butterfinger, Snickers, Reese’s Cups—they were all delicious. Likewise, when it comes to content, it doesn’t matter what topic you’re creating content for. As HubSpot shows, even B2B companies in so-called “boring” industries are creating stellar content. Fun Size candy bars are a Halloween staple. They were the treats most folks handed out in my neighborhood as a kid. But here’s the thing about Fun Size candy bars: It takes double (sometimes triple) the amount of Fun Size bars to do the job of just one King Size bar. I’m not saying Fun Size candy bars aren’t just as wonderful as King Size. (They’re the exact same quality, after all.) What I’m saying is, it often takes more Fun Size bars (ahem, short-form content) to do the same job as just one King Size bar (long-form content). Sometimes more of one thing is just better. This is often the case for B2B content. As Michael Brito relates on Copyblogger, short-form storytelling certainly has its place, but a longer brand narrative that tells a complete story delivers what audiences want in fewer servings. You can buy a lot of ‘em for very little, they have colorful wrappers, and they look like a real treat when kids grab a handful to throw in their bags. But as we all know, penny candy can be a big disappointment to Trick-or-Treaters. It’s no secret content marketing is increasing in popularity. According to Content Marketing Institute, a whopping 93 percent of marketers now engage in content marketing. This has lead to a deluge of content and, as Doug Kessler says, a whole lot of crap. Adding content to your marketing strategy just because it’s the buzzword of the moment is like handing out penny candy on Halloween: It’s only a partial effort...and your audience hates it. If all you’re handing out is penny candy content (like cheat sheets comprised of generic tips and blog posts without real advice or purpose), know that the bulk of your content is ending up just where all the Halloween penny candy goes: in the trash. On Halloween, pennies, pencils, pamphlets, floss and other non-edible “treats” are the stuff of nightmares. (Just ask these folks!) Huffington Post calls items like these the “absolute most-hated stuff,” and it’s easy to understand why: They’re not what the kids expected, certainly not what they wanted, and they give a bad flavor to all the other treats. To be honest, there’s nothing wrong with these items. I used to love winning pennies when playing card games with my grandma, and I find floss pretty darn handy (not to mention hygienic). The issue with non-edible “treats” on Halloween is that they’re wrong for the audience at that time. Strategizing and creating B2B content is only half the battle. The other half is delivering that content to the audience at the right time. That’s where marketing automation comes into play. So what’s the lesson? (Aside from the fact that I really, really like Halloween, of course.) While Fun Size, penny candy and even non-edible treats have their place, you want to be the brand that hands out the King Size content. Give out the good stuff, and you'll exceed expectations your audiences may not have even realized they had. Agree? Disagree? Want to discuss your favorite Halloween candy? Whatever your thoughts, share them in the comments below! A content specialist, Lisa Gulasy manages, creates and edits blogs, eBooks, whitepapers, lead nurturing campaigns, web copy, press releases, and more and manages overall strategy and daily engagement of social media personas. Find Lisa on Twitter, LinkedIn and Google+.